Millwall boss Neil Harris has described Owls pair Fernando Forestieri and Barry Bannan as “two of the best players in the Championship” ahead of tonight’s trip to Hillsborough. 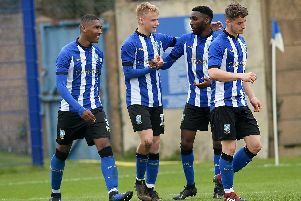 “I saw them (Wednesday) personally at Brentford and going forward they are really impressive,” said Harris, whose side will be chasing their first away win of the season. “They’ve got some excellent footballers. “In [Fernando] Forestieri and [Barry] Bannan, he [Jos Luhukay] has got two of the best players in the Championship, in my opinion. “Obviously there’s not something quite right there having a transfer embargo for a long time, though it’s been lifted so they can add to the group. Fernando Forestieri has scored two goals in three Championship starts this season. Harris has some sympathy for his managerial counterpart Luhukay, who has not made a single summer signing. He said: “For Jos it’s been hugely frustrating, I guess, he’s not been able to bring in players. But fortunately for him he’s got a big squad with some very, very good players. “He has a group of players that didn’t perform to the levels expected last year but just missed out on promotion to the Premier League the year before. It’s a very similar group to that and he’s got the players to get results.”, said: “I have had some injuries during my career here. They were not good moments for me."